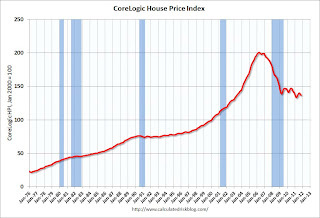 Notes: This CoreLogic Home Price Index report is for October. The Case-Shiller index released last week was for September. 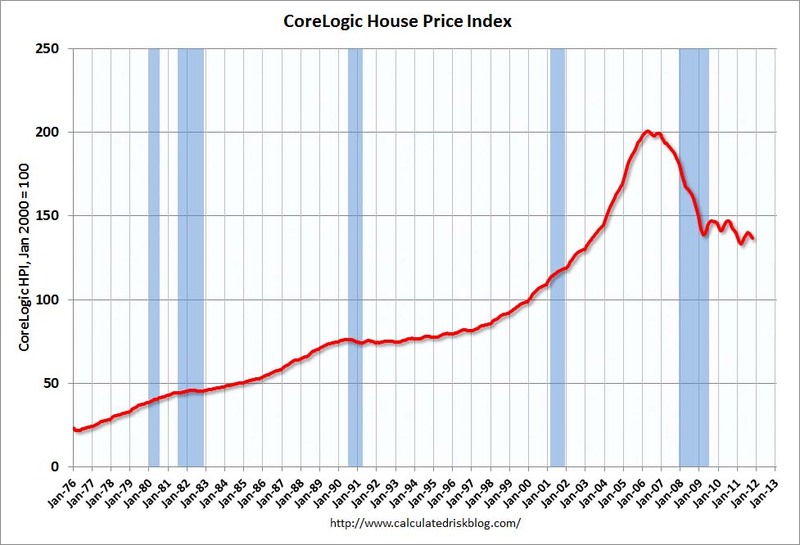 Case-Shiller is currently the most followed house price index, however CoreLogic is used by the Federal Reserve and is followed by many analysts. The CoreLogic HPI is a three month weighted average of August, September and October (October weighted the most) and is not seasonally adjusted (NSA). CoreLogic ...today released its October Home Price Index (HPI®) which shows that home prices in the U.S. decreased 1.3 percent on a month-over-month basis, the third consecutive monthly decline. According to the CoreLogic HPI, national home prices, including distressed sales, also declined by 3.9 percent on a year-over-year basis in October 2011 compared to October 2010. ... Excluding distressed sales, year-over-year prices declined by 0.5 percent in October 2011 compared to October 2010 and by 2.1* percent in September 2011 compared to September 2010. 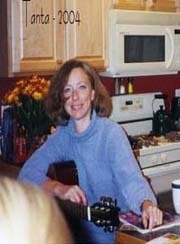 Distressed sales include short sales and real estate owned (REO) transactions. “Home prices continue to decline in response to the weak demand for housing. While many housing statistics are basically moving sideways, prices continue to correct for a supply and demand imbalance. Looking forward, our forecasts indicate flat growth through 2013,” said Mark Fleming, chief economist for CoreLogic. The index was down 1.3% in October, and is down 3.9% over the last year. The index is off 32.0% from the peak - and up just 2.5% from the March 2011 low. Some of this decrease is seasonal (the CoreLogic index is NSA). Month-to-month prices changes will probably remain negative through February or March 2012 - the normal seasonal pattern. It is likely that there will be new post-bubble lows for this index in early 2012.